These are real homes in quiet residential neighborhoods. Residents decorate their rooms with their own furniture, pictures and mementos. Home means no company yard signs – no cavernous dining rooms – no long halls lined with wheel chairs. It means peace and privacy. Be supported by compassionate professionals in a warm, family style setting. Mom will be treated as a person, not a patient. Dad will enjoy activities tailored to his interests, tastes, preferences and abilities, to make the most of his day. Our caregiver staffing level is unusually high. Caregivers have the time to get to know every resident. They anticipate wants and quickly respond to needs. Comforting people is their most important job – avoiding stress, calming anxiety, preserving dignity. Our homes are ranch houses, specially designed for people with Alzheimer’s. Residents receive round-the-clock, professional assistance rarely available in a private residence – and individualized attention that’s difficult to find in a larger setting. Our six houses cater to different levels of cognitive & physical ability. Most residents can live in Care Haven’s homes from Alzheimer’s early through last stages. We’re proud of our staff’s commitment to our residents. In an industry plagued by high turnover, our managers and caregivers stay longer. They value the close relationships they’re encouraged to form with residents, their families and each other. 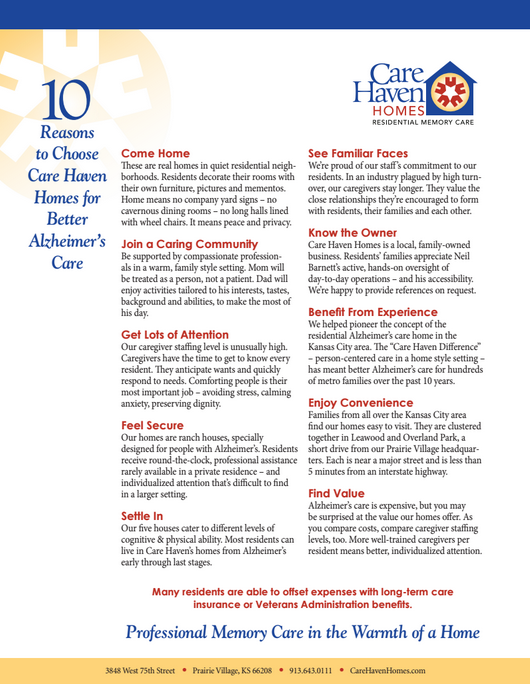 Care Haven Homes is a local, family-owned business. Residents’ families appreciate Neil Barnett’s active, hands-on oversight of day-to-day operations – and his accessibility. We’re happy to provide references on request. We helped pioneer the concept of the residential Alzheimer’s care home in the Kansas City area. The “Care Haven Difference” – person-centered care in a home style setting – has meant better Alzheimer’s care for hundreds of metro families over the past 10 years. Families from all over the Kansas City area find our homes easy to visit. They are clustered together in Leawood and Overland Park, a short drive from our Prairie Village headquarters. Each is near a major street and is less than 5 minutes from an interstate highway. Alzheimer’s care is expensive, but you may be surprised at the value our homes offer. As you compare costs, compare caregiver staffing levels, too. More well-trained caregivers per resident means better, individualized attention. Many residents are able to offset expenses with long-term care insurance or Veterans Administration benefits.